All Aboard the Lighthouse Boat Tour! 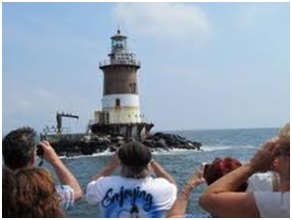 Join the National Lighthouse Museum in their continuing series of Lighthouse Boat Tours on Saturday, September 12, 2015 from 11 am to 2 pm. The tour will depart from Staten Island Home Port, 355 Front Street, Staten Island, NY for a cruise up the East River, passing through Hell’s Gate to Long Island Sound. The cruise will go as far as Execution Rocks Lighthouse and learn of its gruesome history. The Stepping Stones Light is not to be missed. This is a memorable three hour cruise with knowledgeable presenters sharing little known facts about the lighthouses we’ll see.